Remember Ocean's 8? Nah, neither do I. 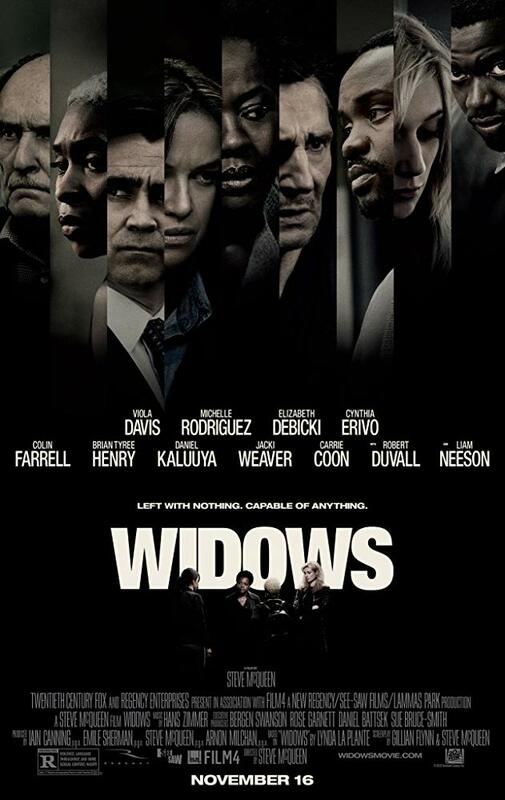 �Widows� is an outstanding crime drama from director Steve McQueen. A female driven movie that doesn't glorify itself as such. It's smart and compelling - emotional roller coaster through out. The themes of corruption, politicians, sexism, race relations, privileges, and greed that mirrors society we know. I was hooked from start till finish. Steve McQueen took something that could�ve been a generic mainstream heist movie, but made it so refreshing. Just like �First Man�, it�s a complete departure from his other work, but isn�t too different where you can�t believe he directed it. Plenty of long shots, especially how he directed a freestyle rap with the camera spinning around a group of characters. I thought that scene was brilliantly done. There�s a scene where Colin Farrell drives to his house after a election promotion, but McQueen mounts the camera on the hood of the car and we only hear Farrell�s conversation while nothing is visible - which is all done in one shot. Rather than cutting back or forward, but McQueen isn�t flat. His directing is bold and makes every shot engaging. How about the cast? It�s something to die for. Everyone manages to get their time to shine. Viola Davis is excellent as usual and the main center of a crowded cast. I love the little details with her character: Like how she always carries around a white fluffy dog almost like a child. She can express grief and the weight on her shoulders and play it effortlessly. Honestly, she�s one of the greatest actress of this generation. Elizabeth Debicki, Michelle Rodriguez, and Cynthia Erivo command the screen whenever they are on. Just like Davis, these wife�s have nothing in common, which serves as development in character with different backgrounds. Great to see Rodriguez finally showing dramatic range. But Daniel Kaluuya scared the sh*t out of me. The intensity in his presence and brutal killings makes him a true threat. Every Time he appears on screen, you know something horrible is going to happen. Colin Farrell and Robert Duvall are so great together, which surprised me to learn that both of they scenes, according to McQueen was completely improvised. Even Liam Neeson, despite the small screen time, but he�s really good and I wish he did more dramatic work than any other �Taken� movie. The other cast members are also great, but we�ll be here for days when naming them off. I could go on forever. Han Zimmer�s score is nothing short of haunting. Gloomy with a heavy theme of loneliness. However, it picks up pace when the heist shifts in gear and everything from there is tension after tension. The beats gets higher and eventually becomes untamed. For issues: There�s not a lot for complains. Although if I have to pick. Since there�s so much going on, it can sometimes interrupt the flow. Other than that, that�s really it. Overall rating: I really struggled to catch a breath.